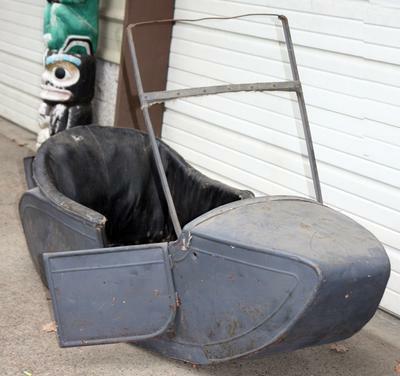 The Vintage Indian Princess Motorcycle Sidecar Body for sale has what might be a windshield frame, the tub, the door, hatch and the back seat but not the chassis. 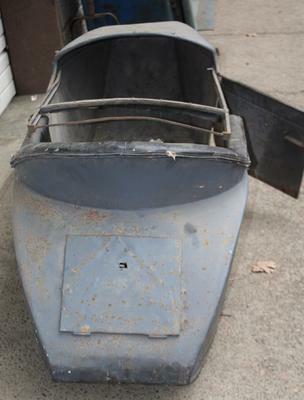 The side car's door latch and trunk latch work and the upholstery possibly could be original to the piece. 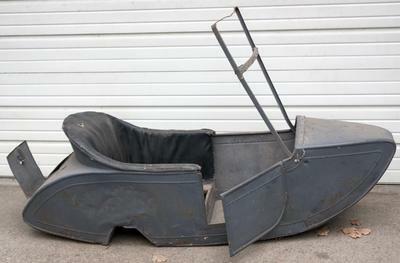 Experts on vintage motorcycles and accessories have told us that this item is from the 1920s or earlier. It has no "rust through" and its condition is fairly good and ready to restore. If you have any questions regarding this piece of Indian motorcycle history or if you would like to make an appointment to see it in person or make payment and pick up you can do so using the space below that has been provided by Strike Lightning's GoGoCycles Used Motorcycles for Sale and PLEASE do not neglect to include your contact information in your email or to provide a phone number or email address so that I can respond with answers to your questions or set up an appointment as quickly as possible. In my opinion you don't find antiques in condition like this for sale around Junction City Oregon OR every day or for that matter, on Craigslist or in an Ebay auction so hurry and make an offer before this rare item gets away from you! Strike Lightning would also encourage our biker friends to write a review of the Vintage Indian Princess Motorcycle Sidecar Body or share any thoughts and/or opinions to make potential buyers aware of any problems that are commonly associated with this brand or to highlight its positive features and help our visitors make informed decisions. My asking price is only $3000 which is a very good price for motorcycle memorabilia and collectibles of this age but I am also willing to accept reasonable best offers so e-mail me today and don't forget to mention that you found this ad on Strike Lightning's Motorcycle Classifieds www.gogocycles.com using the comments forms located on this page.